Easter is coming soon. And we have information to share with you on what to do and what to see in Florence and Tuscany next weekend. Most of the museums in Florence will be open on Easter Sunday and Monday (April 4 and 5). In particular some State Museums are “extraordinarily” open such as the Uffizi Gallery and the Accademia Gallery which are generally closed on Mondays. The Pitti Palace and Boboli Gardens, the San Marco Museum, Medici Chapels, Bargello Museum and Palazzo Davanzati will all be open.We recommend you check opening hours before visiting museums, since they can be different from usual schedules as well as suggest you book museums tickets in advance because Easter weekend is really busy and standing in line for hours is not the best way to pass it. 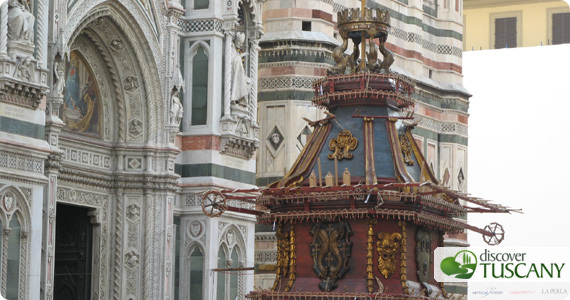 On Easter Sunday at 11.00 am the popular Scoppio del Carro in Piazza Duomo takes place in Florence. The Explosion of the Cart dates back to the 17th century and is a traditional ceremony carried out to figure out how the year’s harvest will turn out, a good omen is if everything goes off according to plan. The celebration is extremely beloved by Florentines. Before the explosion there is a delightful parade in medieval costume with flag throwers, commemorating Florence’s medieval Guilds. After lunch you can visit Panzano in Chianti and enjoy the Aprilante Fair enjoying good food and the wares made by artisans along the streets. In Italy, on Easter Monday we usually go out for a day trip to the countryside, enjoying a picnic in Chianti or in Mugello. If you want to follow our tradition there are some nice events across Tuscany that you can include as part of your visit. In Pontassieve there is a great exhibit this spring called “Beato Angelico in Pontassieve. Paintings and Sculptures from the First Florentine Renaissance” that will be open on Easter Monday from 9.30 to 12.30 and from 3.00 to 7.30 p.m. Many artworks from early Renaissance are displayed, such as a beautiful Madonna by Beato Angelico. In Scarperia in the Mugello valley you’ll find the beautiful Flower exhibit “2000 Flowers in Scarperia“. If you want to breathe and smell spring in Tuscany, we recommend you visit anytime between 10 am and 7 pm in the Renaissance center of the city. If you are looking for antiques or other interesting older items, you can visit the antiques market in Fiesole in the main square. Or go to Chianti stopping at Greve in Chianti’s large antiques fair where you can find almost anything. We’ll keep our fingers crossed so that the nice sunny weather we’ve been having this week holds so that we can all spend a warm Easter in Tuscany full of sunshine!